Purpose: Spinal interbody fusion cages are designed to provide immediate stabilization for adjoining vertebrae and ideally enable bony ingrowth to achieve successful integration. For such an implant, cells must be able to attach, move, grow, and differentiate on its surface. These cellular interactions are dependent on how the implant surface enables the coating and binding of blood and tissue fluid proteins that support cell adhesion. The purpose of this study was to evaluate the in vitro and in vivo osteoblast cell–implant surface interactions that result in osseointegration onto a surface composed of plasma-sprayed titanium on a polyetheretherketone (PEEK) substrate or titanium-coated PEEK (Ti-PEEK) (PlasmaporeXP®) as compared to uncoated PEEK implants. Materials and methods: The influence of the Ti-PEEK surface modification on the biochemical, biomechanical, and histological properties at the bone–implant interface is demonstrated both in vitro using simulated bone-forming cell culture experiments and in vivo using a 12- and 24-week ovine implant model. Results: Osteoblast-like cells attached to the Ti-PEEK surface upregulated early bone-forming activity as measured by an increase in transcription and translation of ALP and BMP-2 when compared to cells on PEEK. 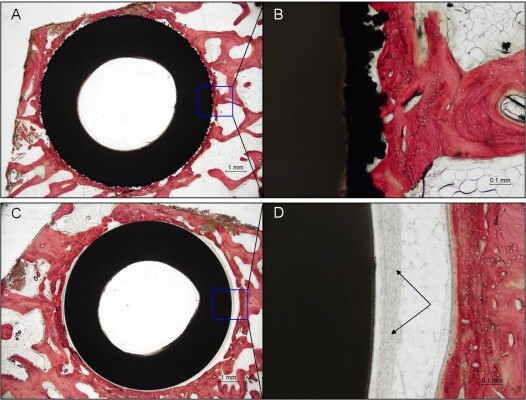 Similarly, a significant increase in new bone formation, bony apposition, and pullout strength was demonstrated on Ti-PEEK implants when compared to PEEK implants at 12 and 24 weeks in an ovine implant in vivo model. Conclusion: The study shows that the Ti-PEEK surface demonstrated enhanced osseointegrative properties compared to PEEK both in vitro and in vivo.